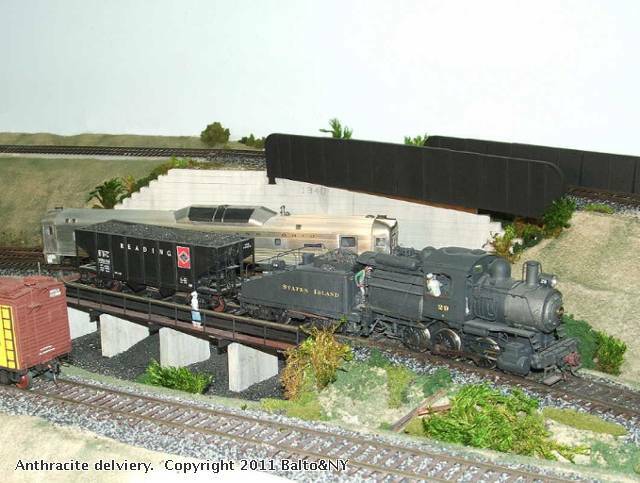 This dealer's coal dump trestle was built from B&O plans drawn in 1946 for replacing older timber trestles that had become weakend with age and rot. In about 10 years they would become unused, as more people and small businesses changed to oil and gas for heat over coal. Two 50 ton twin hoppers can fit and unload on this dump trestle at a small coal dealer's yard. Wood was used for the piers and painted with linen color acrylic to represent fairly new concrete. This scene is set for the early 1950s. Steel sections are built up in styrene shapes with a wood walkway on each side. Following B&O practice, the wheel stop has both rail ends bend upward in a curve that matches wheel contour. This was done by heating the Code 125 nickle silver rail with a torch until it glowed yellow, then slowly bending it to the curve desired. 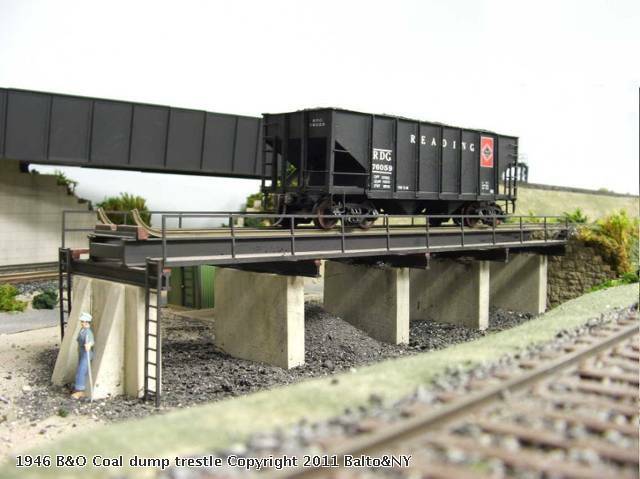 End view of the B&O designed concrete and steel coal dump trestle for local coal dealer's yard. The structure is made of wood, styrene and Code 125 rail. The coal piles are made with index card cones painted flat black and sprayed with glue, then covered with ground coal. Problem" In time coal may oxidize if not clear coated to keep it out of contact with the air. This slow oxidation forms a grayish coating of ash. Will need to do another coal coat to freshen it up. The Reading hopper was originally built in 1954 from a Walthers kit. It was "re-kitted" and built over again in 1980, with added detailing.